I am so happy and excited! 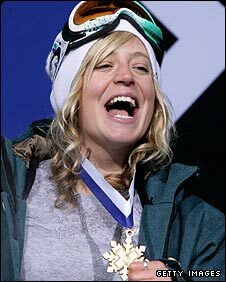 My friend Jenny Jones has won a gold medal in the X Games slopestyle. How amazing is that? A British girl winning the biggest snowboard competition in the world. Yay! I can’t for the life of me get this bloody video to embed, so click here if you’d like to check out her winning run which includes an 80 foot 720. Go Jenny!